Responsibility is for noobs and babies. It takes an incredible amount of effort to be responsible and it leaves very few oppurtunities for laziness. Have a good weekend and see everyone on Monday! I plan on enjoying the SWTOR beta over the weekend. Maybe I’ll be able to put some thoughts together next week some time. 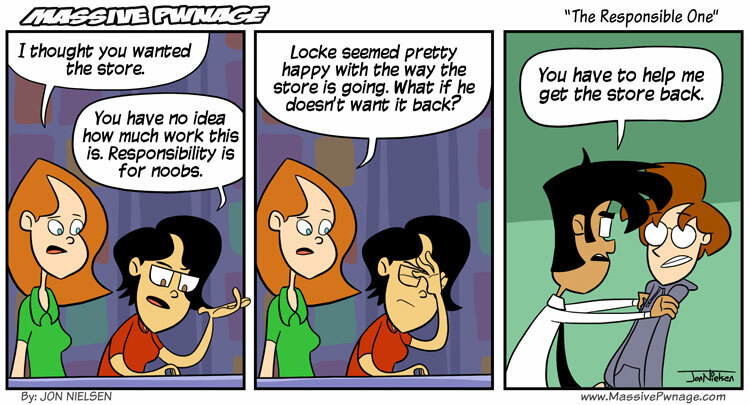 This entry was posted on Friday, November 25th, 2011 at 12:00 am and is filed under Comics. You can follow any responses to this entry through the RSS 2.0 feed. Both comments and pings are currently closed. Star wars republic beta you say? I am just about to make my character on that, it looks amazing. But the game I’m really waiting for is the Forgotten Realms mmorpg. FR has more Drizzt than SW. But i come back to a lost store. Nostalgia at its finest.